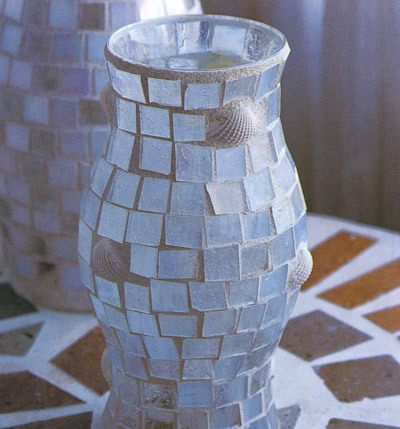 Liven up glass pots and vases by decorating them with glass mosaic tiles and shells. The glass tiles will give the vase a lovely translucent quality which is ideal for candle-holders. Use a spatula to apply a thick, even coat of tiles adhesive to the vase, then carefully stickon the tiles. As you do so, place decorative shells at random points between the tiles. Once dry, apply grout between the tiles to finish.